I was introduced to pottery in high school around 1969 and bought my first wheel in 1970 and worked in the basement of my parents home. I studied some ceramics in college at both Mt. Hood Community College and the University of Oregon. For many years to come I worked primarily with Cone 6 white clay with a “dunk & brush” glaze technique. In 1989 I decided to do a complete change over and began using a beautiful terra cotta clay body. I was also developing a technique of spraying and masking glazes and underglazes. The resulting patterns were at times unpredictable and sometimes images would start to appear. One of these images was the image of a fish. 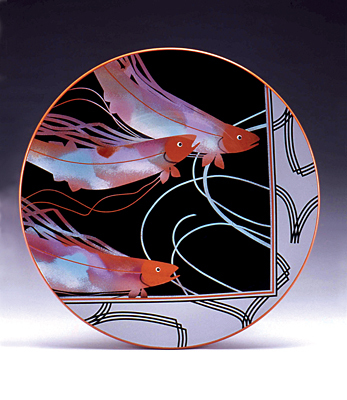 The colorful fish image on a black background was chosen as Best of Show for the 1990 Ceramic Showcase as well as Best of Show 1990 Artquake. Today, now 28 years later, with some breaks away from my pottery career, I’m still using the same beautiful terra cotta clay body and the glazing techniques with my pottery. I’m now also using those same glazing techniques on groupings of unglazed tiles creating mural-like pieces that I frame with wood for wall pieces or even for table tops. The last several years I’ve shifted my focus to a line of high relief tiles originally to be used as back splashes or accent bands amongst field tiles. Things really changed after an “Aha!” moment in which I realized I could use a wet saw (tile saw) to cut and glaze tile frames for my high relief tiles. This began a whole new and growing direction in my work.